Horses and Smoke do not go well together. 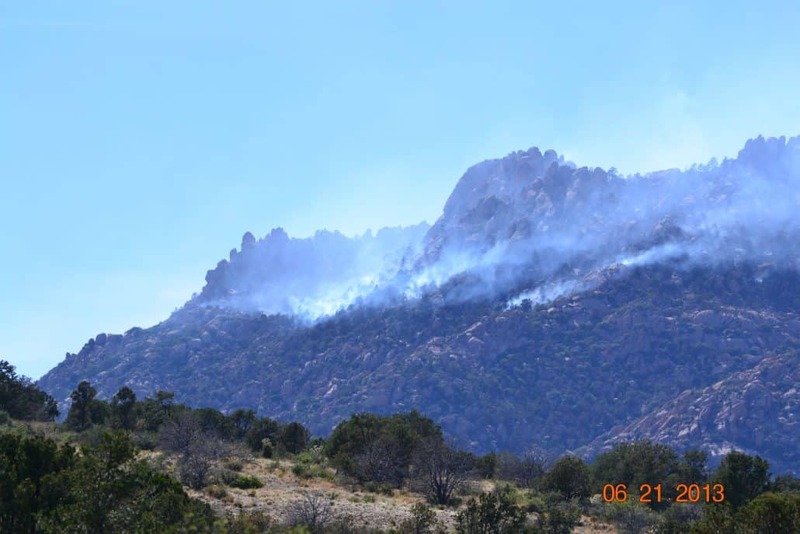 The obvious signs of smoke from the Tinder fire should be a reminder to everyone about how quickly a fire can start from just a campfire being in an unauthorized area and being left unattended. It also brings back the memory of the Rodeo-Chediski fire in June 2002 and the Dose fire in June of 2013. The Dose fire I remember well, being I live at the base of Granite Mountain. My son called from Orleans, California to tell me that the Doce fire was heading our way and if it comes over the pass, we need to get out. My son is a career wildland fire fighter with the US Forest Service and was stationed here in Prescott. I watched many horse owners try to figure out what to do if they had to evacuate. A good friend of mine who lives on Mint Creek had to evacuate and she called me to help with her horses and miniature donkeys. There was much that went wrong that week, as well as much that went right. When trying to get up Williamson Valley Road, I had to dodge look-e-loos parked on the road taking pictures! Then, there were those that were unable to get their horses into trailers at all. When the officials finally set up road blocks at both ends of Williamson Valley Road, evacuation then became easier. As you can see Eileen’s trailer is large enough to hold all six of her horses. You are probably wondering where this is all going too? It just so happened that my Hackney pony mare was in foal at this time. I consulted my veterinarian for the best thing to do with her and the rest of my horses during the fire. Because my pony was older, my vet suggested that I keep her as quiet, and in no way exercise her! The smoke has a drastic effect on horses to start with, but her being pregnant, it would be even worse. This study from the University of California Davis proves that horses and smoke do not go together. Smoke is an unhealthy combination of carbon dioxide, carbon monoxide, soot, hydrocarbons, and other organic substances. Smoke is a mixture of solid and liquid particles that are in the air. They can irritate your horse’s eyes and respiratory tract, which then hampers their breathing. All horses should have very limited activity whenever smoke is visible. Even a human has eye and breathing problems during a forest fire. Remember horses and smoke do not go well together. If you have a scheduled event in an area that is smoked filled due to a fire, it is always better to cancel and be safe then it is to go! Several years ago, the organizers of the Tevis Cup canceled the race because of the amount of smoke in the area. Now, if you must evacuate then you are faced with the problem of getting your horse or horses out to a safe area. In my situation during the Dose fire, we were on stand by evacuation for a week, as the fire management had no way of knowing which way the fire was going to go. Fires can be very unpredictable! I had my large trailer hooked up and ready to leave at a moment’s notice. 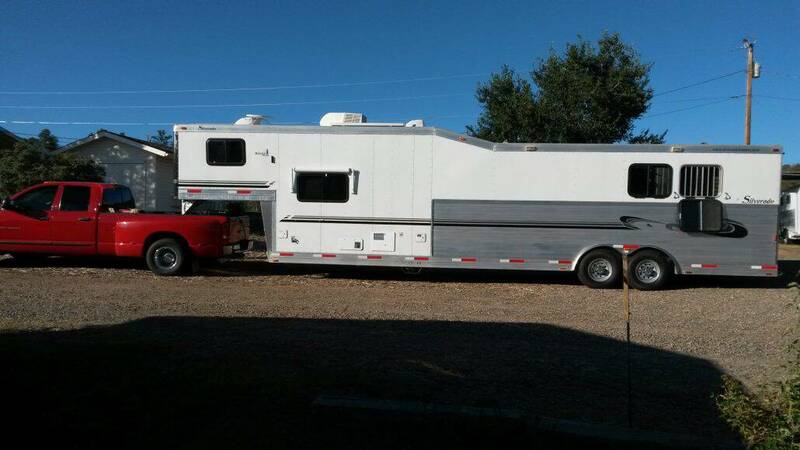 I can get all six of my horses into my trailer at one time. There were many people who had to evacuate and did not have trailers big enough to get all of their horses into. Many people need to take several trips to get all of their horses out. Everybody stay calm!! If you’re not calm your horses will not be calm. Act as if there is nothing special about this trailer ride. Always be sure that your horse is trained to get in your trailer. When it’s time to evacuate, it is not the time to train your horse! Load your horse like you would at any other time. If you use leg wraps, then put them on. If you use a different halter, then use it now. The horse needs to think that this is just like any other ordinary trailer ride. Don’t be in a hurry. If you are, your horse will think there is something wrong. If you normally load your horses by yourself, then do it by yourself. 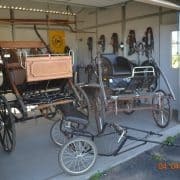 I know it is tempting for friends and neighbors, that may or may not know anything about horses to volunteer their help. Graciously, refuse their help. 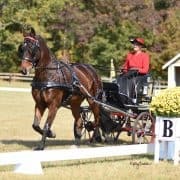 If you have multiple horses, load them in the same order that you would if going to a show or trail ride. 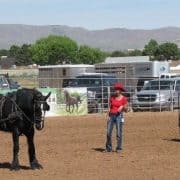 Give your horse time to think if he needs it to get into the trailer. My Friesian Sporthorse will always stand and look into the trailer for maybe up to sixty seconds before getting in. This is his normal. 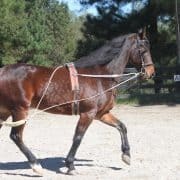 You don’t want to change your horses’ normal routine of how he gets into his trailer. You Can Smell The Fire In The Air! Most evacuations, especially with fires, we are all able to see and smell them well before the actual notice. 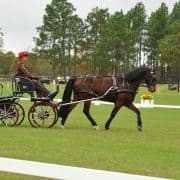 This is the time in which you need to get together any special medication that your horse will need along with a copy of his registration papers to have in your truck. All of the other stuff you might want to bring like feed, tack, buckets, blankets, etc. are just material items that your horse can do without during an emergency. Your horses will survive on whatever food and water is at the stable of facility you are evacuating too. The most important thing is to save your life and the life of your horse!